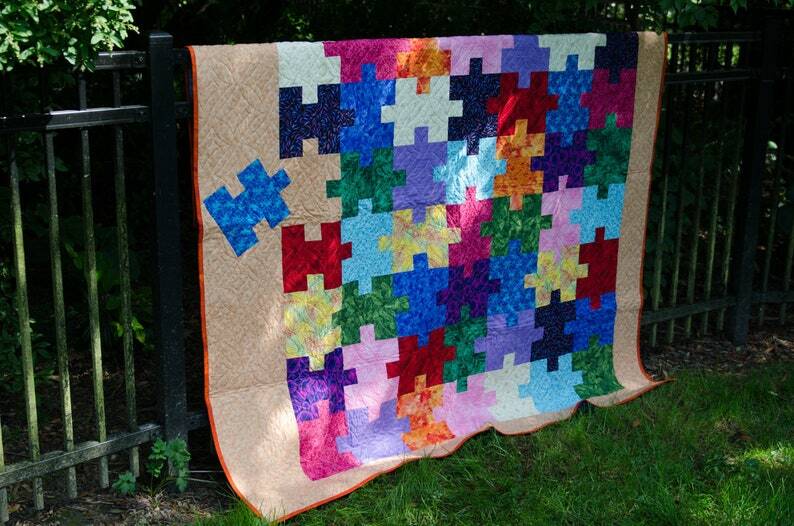 Based on my love for jigsaw puzzles, I designed a puzzle quilt. The original design was for a completed puzzle top but due to some, ahem, design choices (not mis-cutting), the quilt was made with an incomplete quilt top and a "loose" piece appliqued in the border. Instructions for both variations are included in this pattern. The pattern includes fabric requirements, color photos and diagrams, and the instructions for either variation. This pattern is fat quarter friendly though it could easily be used as a stash buster. The variation with the completed puzzle top finishes at approximately 68" x 76". The variation with the piece appliqued in the border uses larger borders and finishes at approximately 71" x 78"
Please note, this is for a digital copy of the pattern. challenging pattern that should be perfect for my daughter, anxious to get started! Great! Thank you! Just what I was looking for. I love the blanket! Very high quality, and well made. Super fast shipping. Unless the item comes damaged, all sales are final.